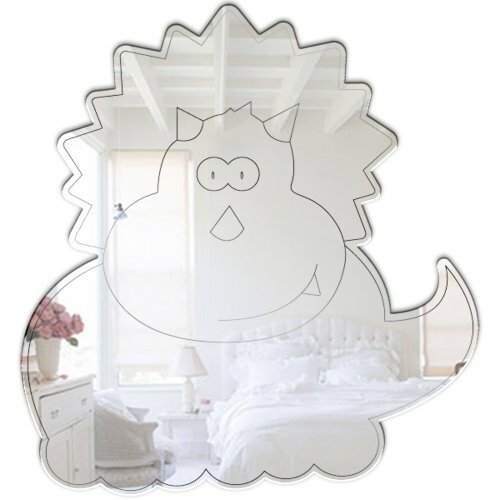 The Mungai Mirrors Baby Triceratops Acrylic Mirror (45cm) is a lightweight and shatterproof children's mirror. It is easily mounted to clean, dry, flat surfaces using the strong adhesive pads supplied. It is made from high quality Plaskolite 3mm thick acrylic mirror which has a high break resistance being up to 10 times stronger than the glass equivalent and benefits from shatterproof qualities. The mirror comes with a protective film on the reflective surface (which dulls appearance until peeled off) which should be removed prior to mounting. Acrylic mirror has excellent reflective qualities and must be mounted to flat surfaces. If you have any questions about this product by Mungai Mirrors, contact us by completing and submitting the form below. If you are looking for a specif part number, please include it with your message.